Review: Historical, interesting, and downright funny are some of the many different words that describe Lives of the PresidentsFame, Shame, (And What the Neighbors Thought) . This updated book by Kathleen Krull and Kathryn Hewitt makes you laugh when you hear what some of our presidents have done. Are you curious to find the odd things about each president? Then you have read the right review. Find out some of the most interesting historical facts to ever be published. Our book starts with George Washington. I am not referring to it as a story because the book is made of a collection of small biographies of each president. The book goes in order of when the president took office. From the first president to the 44th president all are included. In each biography, you get some basic information. It includes schooling, family, historical accomplishments, and fun facts. Sometimes they include favorite sports, foods, bad habits, and renovations to the White House. Which president was the first to install electric lights? Who tailored his own suites? Which president is considered our worst president? These questions and many, many more are answered in this collection of biographies. I absolutely love this book! I found it very interesting. There are so many things that I never knew about that happened in the White House. All sorts of unknown things about their childhood are brought to your attention. Abraham Lincoln walked six miles to borrow a grammar book when he was young. Lots of interesting things like that are in Lives of the Presidents. You never know what is coming next in the book. Of course, there are some known facts and accomplishments. George Washington being a general in the Revolutionary War is an example. We all know that but the authors elaborate on details of the event. The book is all about the unknown details of our presidents' lives. I could not keep myself from laughing at some of the things our presidents did. Such as barking like a dog. Lives of the Presidents also made me realize how much I do not know about history. It made me want to learn more about things I have not experienced and have not learned. If only the rating scale went to six stars! 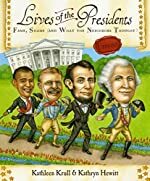 We would like to thank Houghton Mifflin Harcourt for providing a copy of Lives of the Presidents: Fame, Shame (and What the Neighbors Thought) for this review. Have you read Lives of the Presidents: Fame, Shame (and What the Neighbors Thought)? How would you rate it?